Long before he made his 2008 bid for the presidency, Senator John McCain was the darling of the Washington press corps. He had cultivated the image of a realist hawk; a raptor who was critical of others of his kind. The sort of gent who was not afraid to criticise his peers in the Senate (and former peers in uniform) for wanting to shovel barrels of pork at every billion-dollar gewgaw the military-industrial complex could dream up. Meanwhile, McCain took PAC money from the defense lobby just like everyone else. “Over [about 15 years], Congress has authorized and appropriated funds for 113 F-35 jets. Lockheed has, however, delivered just 11. … Some of us saw this train wreck coming.”—Sen. John McCain (R-Ariz.), remarks at Senate Armed Services Committee hearing, May 19. “We want to increase funding for the F-35 Joint Strike Fighter, an aircraft and weapon system that in the view of many experts—including my view—would be far more capable [than the F-22] of meeting the emerging threats of the future.”—Same senator, Senate floor speech praising the F-35 when his immediate objective was to kill the F-22, July 13, 2009. Good one, John. Tell us another one! 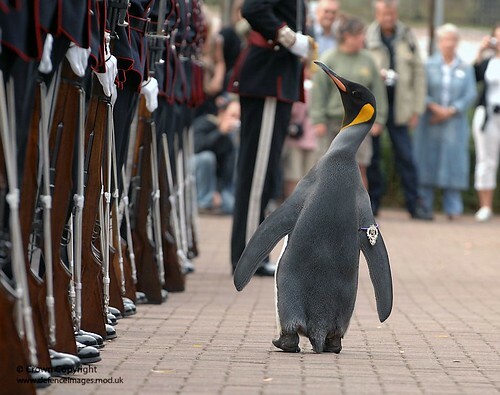 Nils Olav the Penguin inspects the Kings Guard of Norway after being bestowed with a knighthood at Edinburgh Zoo, originally uploaded by Defence Images. Words fail me. But if they can keep a straight face, well, good for the Norwegians. Apparently a change I made to the site’s .htaccess file back in the summer had the unintended effect of killing the RSS feed for certain feed aggregators. Thanks to Dax for the notification, and apologies to anyone wondering why posts/updates weren’t appearing in the feed. Ben has an eminently sensible position on Lord Black of Crossharbour’s appeal to have his resumption of Canadian citizenship expedited by the federal cabinet. I agree with David Frum‘s assertion that had the scenario involved anyone other than Conrad Black, the Liberal government of the day would likely not have dredged up the 1919 Nickle Resolution to block the honour. But actions do have consequences, and Black coughed up his citizenship voluntarily and without duress. There’s a cost that comes with such decisions, freely made. Nicholas Russon notes that Foursquare (a geo-location social media site/app that lets one broadcast one’s location to the world) can be used with devastating effects by thieves, stalkers, and so forth. I do not understand how people can continue to be surprised that sharing significant personal information with anonymous strangers can yield up negative consequences. Frankly, I always give false information to non-financial websites on the assumption that—at some point—their data will become compromised. Did everybody but me realise that Darcey Jerrom was still blogging at MetisOnline? I knew Dust My Broom had transitioned into an all-blues, all-podcast site, but I hadn’t realised (until I saw a referrer in the stats log) that Darcey was still plugging away at his non-music blogging. God bless him. Too many bloggers drop off the face of the internet, and I admire tenacity. Stephen Trimble at The DEW Line notes that by the end of FY 2011, DoD will have paid out USD $67.9 billion for 101 (on-order) F-35 aircraft since contract award in October 2001, with somewhere between 28 and 58 of those being delivered. Meanwhile, also in FY 2011, the same contractor (Lockheed) will have been paid 66.7 billion for the F-22 program, with 188 aircraft on contract and nearly the entire fleet delivered. One unexpected side effect of the PC operating system reload is that I discovered that the blog’s image-hotlinking protection was allowing the US Google Reader site to display images from my blog posts, but not any of the international localisations (i.e. google.ca, google.co.uk, google.com.au, and so on). This should be remedied for most of the international Google Reader sites but there may be the odd outlier for whom my code doesn’t work. If you are one of those people, please let me know which country you’re from and I’ll do my best to fix it. Your correspondent is pleased to announce a return to blogging duties. The past few weeks have generated a perfect storm of geek work that has been a lot occupying my attention of late. A week or two ago, my wife’s somewhat aged HTC TyTn mobile phone was causing her excessive frustration. I know this because I saw her smash it against a tabletop several times after it dropped a call for the millionth time. Like any smart husband I subsequently deduced that it was in my best interests to find my wife a replacement smartphone that was less aggravation-inducing. After doing some research and soliciting advice from owners of various platforms, I could not escape the conclusion that the iPhone was the most polished and reliable device in its class. Despite significant inner horror at the prospect of joining the Steve Jobs Cult, I picked up a pair at the right price; my own mobile phone was actually an old Motorola RAZR on loan from a friend, and strictly speaking, I ought to get it back to him. I was pleasantly surprised at home quickly one can get acclimated to the iPhone GUI and gesture conventions, and overall I am happy with the device. I find it to be a fairly decent netbook replacement for many tasks, blogging excepted. This I blame on the inelegance of the clunky WordPress app, rather than any inherent failing of the hardware. The arrival of these new miniature beasts led to another reckoning which I had put off for many years. My MP3 collection is not especially large—the whole of it can actually fit on the device—but virtually none of it is properly tagged, as it was encoded back in the days when ID3 tags had only just been adopted. iTunes relies on these ID3 tags to organise and present your music, so the lack of proper tags in your music files presents a great impediment to using the device effectively as an MP3 player. So I am slowly but surely working my way through the song library, filling in details like the artist, album name, track number, genre, composer, album cover art and so on. Not to mention the great tedium of re-ripping and replacing those files which are encoded at bitrates which we find tinny and unsatisfactory today. The iPhone’s greatest problem, though, is that it has a multiplicity of potential functions and roles, and there are thousands of free and inexpensive 1- or 2-buck apps to help it fit each of them. Some of these (but by no means most of them) are games. The natural temptation is to try a great many apps and games, resulting in the device becoming a giant vortex of time-wasting. Then there was the destruction of my primary home workstation, only a couple years old but running a creaky installation of Windows XP. The system registry died a horrible death, and after struggling with it at length I realised it would be easier to load Windows 7 instead. The good news is that due to wise network storage policies and rigorous backups, I didn’t lose any user data. Also on the positive side, Windows 7 has behaved very well; I have not run into any application or game that requires the use of the much-heralded Windows XP mode. About 90% of the application software was reloaded within 48 hours. The bad news is that my two MS Flight Sim installations—which had probably a thousand addon aircraft, sceneries and utilities—will take a couple of weeks to reinstall. Minor chores, in the grand scheme of things, but they are getting sorted out slowly but surely. As a surprising number of hits come from image searches, The Company has recently increased our image hotlink protection measures. In practice this means that image requests made by servers other than our own will not be processed. We do recognise, though, that there are many readers vis Atom and RSS feeds. If you are using Google Reader, images should still appear properly when reading our feeds. If you are using a different RSS reader, feel free to let us know the name/platform in the comments, and we may try to support additional readers as time and volume permit. 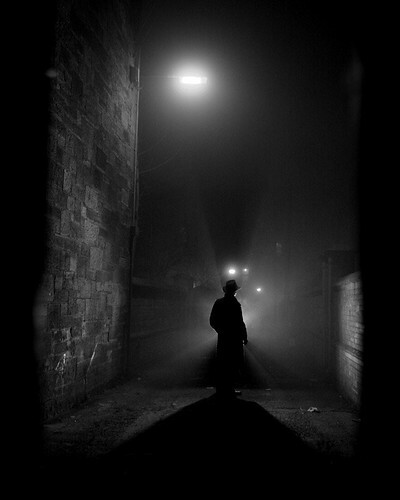 Film Noir 1, originally uploaded by NapalmPhoto. 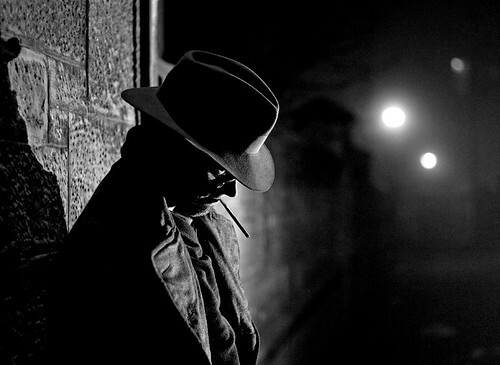 Film Noir 2, originally uploaded by NapalmPhoto. Terry Cordell: You can’t expect to dodge the police indefinitely, George. Wouldn’t it be smarter to go to Cochrane and get this thing out in the open? George Steele: Just about as smart as cutting my throat to get some fresh air. — Crack-up. Dir. Irving Reis. Perf. Pat O’Brien, Claire Trevor, Herbert Marshall. 1946.